Note:These are only sites that I have visited personally and explored. I will vouch for the good quality cruising found on these sites. If your site isn't listed here yet, it's either because I haven't gotten around to it (I have tons of cuiser links bookmarked that I haven't posted here yet), or because I don't know about your site yet. If you would like to link up, drop me an email and I'll get you up here as soon as I can! Cool Cruisers of Texas restores Land Cruisers, and sells parts you can't get anywhere else, such as the sheet metal body parts I am using for this project. I ordered most of the stuff right over the web. They have promised to support me in this project, hold my hand for the stuff I have never done before so to speak. So far, all they have had to do is sell me parts and give me some tips and pointers over the phone and via email. The parts are high quality, delivery, pricing and terms are good. They basically do what they say they're going to do, when they say they're going to do it. I guess you can't ask for more. If I screw something up I hope they will point me in the right direction. Cool Cruisers has also put up a bulletin board, called "Info Exchange" in which cruiser heads can post messages offering cruisers and parts for sale or wanted, ask and respond to technical questions we have about particular problems, and share information with each other. It's pretty cool, it has become an online virtual community of cruiserheads, similar to the List, but a different group of people. I visit it every day. Man-A-Fre is another great source of new, used and aftermarket parts. They have a great catalog, and you can order over the web once you have placed your first order. I have bought quite a few parts for this project from them. Spector Off Road is a wonderful source for new and aftermarket parts. I have also ordered and received a lot of cruiser parts from them, they have a great catalog and online web store. I recently placed my first order with TPI Land Cruiser and was impressed with the price, delivery and service. Up and Over Innovations is a leading supplier of Land Cruiser goodies. JT Outfitters in King, N.C. supplies all kinds of cruiser parts, from aftermarket to stock OEM. I have emailed with the proprieter, Joe Turpin, and he is also a lister on the LCML. BTB Products manufactures and distributes all kinds of great Cruiser aftermarket parts, they can help turn your cruiser into a real rock eating machine. 4 Wheel Parts Wholesalers has a nice site offering all kinds of aftermarket parts. I have never done business with them, but they seem to have pretty good pricing and selection. While 4 Wheel Drive and SUV isn't only about Land Cruisers, this is a good site, and they have test reports on cruisers. Alcan Spring makes excellent offorad suspension for Land Cruisers, made to order. I have seen these springs first hand, and they are excellent. Aqualu Industries makes aluminum tubs and body parts for Land Cruisers. 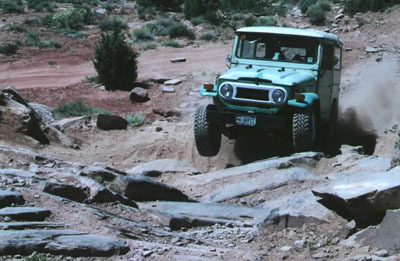 From what I have heard and read, it is a very easy way to replace that rusted out body on your FJ40. Stout Equipment makes bumpers and all kinds of aftermarket goodies for our cruisers. Of course, Warn Industries has supplied us with the locking hubs we are all so familiar with, and some of the world's best winches. Catch all the features and specs on their site. Here's a link directly to Toyota's Japanese site for their 70 Series Land Cruisers. This is the SWB vehicle that they sell all over the world, but not in the US. The word is that it would be too expensive to meet current emission and safety standards, and they make a lot more profit on the $50,000+ UZJ100 currently sold here. Land Cruiser Connection in Sterling Virginia sells all kinds of Land Cruiser parts. I haven't done business with them but they enjoy a very good reputation in the Land Cruiser community. TLC buys, restores, services, and sells Toyota Land Cruisers exclusively. They are located in Van Nuys, California. SleeOffroad is a local dude who makes excellent off road accessories and modifications for and to 80 series Land Cruisers. CarTalk.com is a must visit site for any automotive enthusiest. They will tell you that if you drive a Land Cruiser, you care too much for your car, and that you should be driving a Dodge Colt Vista. Take their quiz, it's too funny! CarParts.com is another online resource for replacement parts. I have never done business with them, but I like the way their site gets you quotes on a variety of parts. While this isn't really a company or supplier, the author of this web site makes a comprehensive, scientific comparison of various oil filters. This is a Must Read Site if you are interested in the longevity of your engine. And to go along with that link to the oil filter study, here is a link to Ed Hackett's Oil FAQ. Interesting stuff! Fastenal is a distributor of fasteners, and they appear to have all the metric nuts and bolts we need to keep out cruisers in tip top shape, including stainless steel and automotive grade high-strength fasteners. Hammerite makes some of the most durable automotive paints in the business. Check them out. POR-15 is probably the most widely recognized coating for auto preservation. More of a ceramic or epoxy than a paint, it is reportedly tough, durable, hard as a rock, expensive and tricky to apply. Harbor Freight Tool distributes a wide range of tools for wrenching on our cruisers. I would say that somewhee around half of all my tools I have bought from them. Even though it sucked for off-roading, I would say that the Holley carb that came on my '71 FJ40 was an incredible boost to my performance, on the road it was like having a V8 instead of the tired stock F engine. Another auto tool supplier is OTC.com. Looks like they got some pretty cool stuff there. Auto Restorer Online has the Restoration and Repair Tips site for all kinds of restoration related tips. If you go to Cruise Moab, Slickrock Campground is the place to be. Check out the rates and accomodations.